Think it's too late to march this summer? Think again! Still hoping you can join the ranks of the world's most elite marching music ensembles this coming summer? Believe it or not, there's still time to do so! Many exceptional corps across the country are currently looking to add performers to their rosters as they make their final off-season preparations before hitting the road for spring training and the 2010 Drum Corps International Tour. Corps looking to fill open positions will typically post available opportunities on their Web sites or Facebook pages. Visit DCI.org/corps for a complete list of contact information for all Open and World Class corps. Even if a group doesn't have any positions posted, it never hurts to ask! Fire off an e-mail or give the corps of your choice a call. Your journey of a thousand miles on a drum corps tour bus may simply begin with a single click of the mouse button! See you on the field this summer! 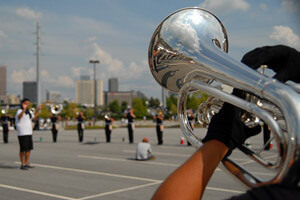 View a list of all DCI World and Open Class corps.